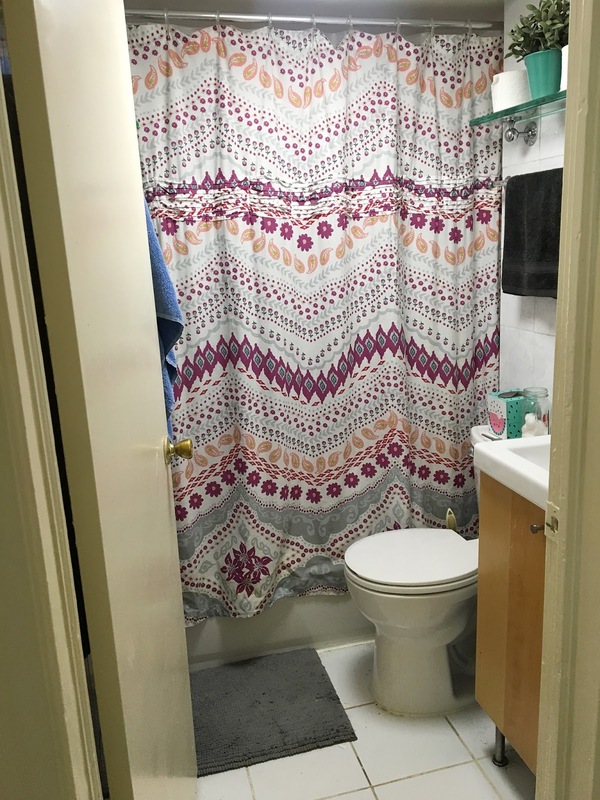 Confession: I have had the same shower curtain since Junior year of college. That is a long a** time to look at the same floral print, day in and day out. 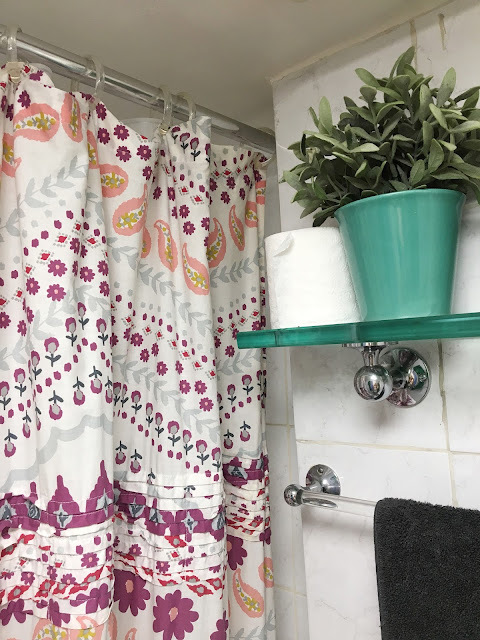 You'd think buying a new shower curtain would take less than five minutes and very minimal brain power, but for some reason I've always thought I needed to tackle the whole space, not just the shower curtain. 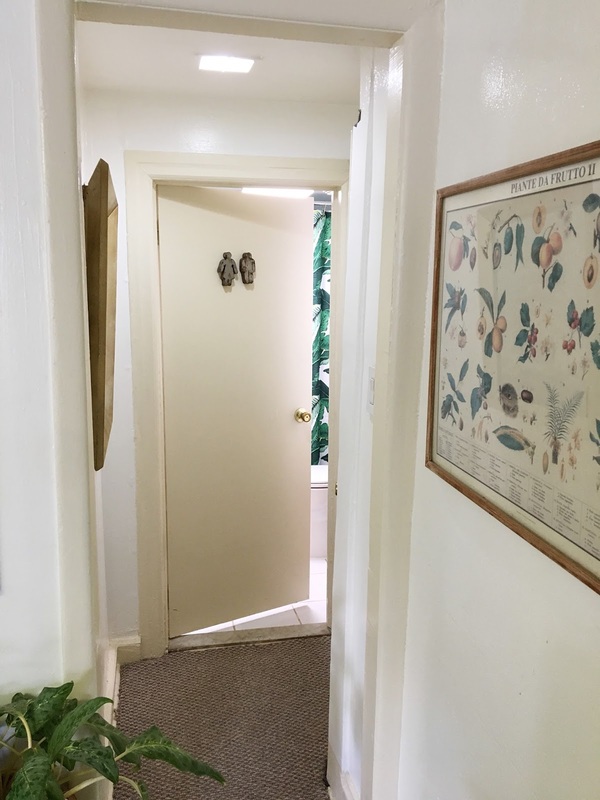 Here's the thing: our apartment is in the basement and gets very minimal natural light. Our bathroom is tucked away at the end of a little hallway that's view able from the front door and has no zero windows. We also have tiling throughout the entire space, making it impossible make updates with normal tactics, such as paint, removable wallpaper or even artwork. Essentially we're pretty limited in what we can do. 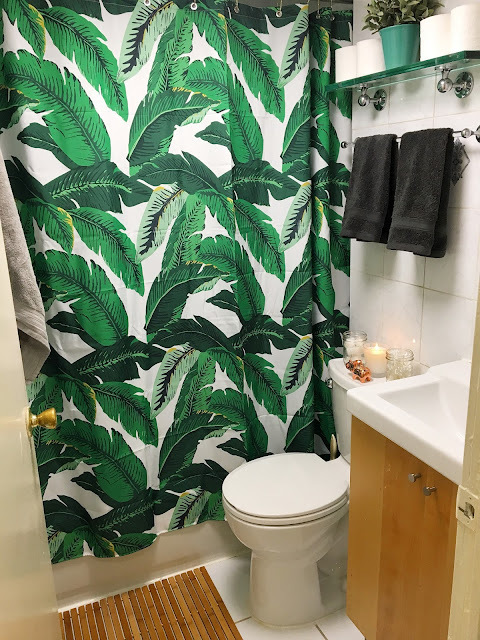 After seeing a real home tour on Apartment Therapy that included a banana leaf shower curtain and accents of bamboo, I knew I'd found a solution to the space. 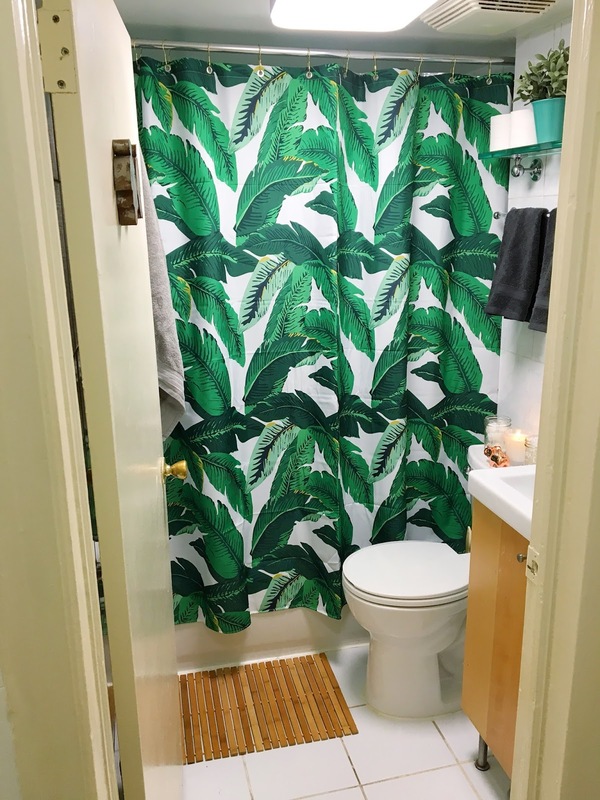 The Apartment Therapy home tour linked Amazon as the source for the shower curtain. Like any logical human, I started my search there. I also cross referenced the usual home wear suspects: Target, Bed Bath & Beyond, World Market and West Elm. Ultimately I found a print I liked on Amazon and took full advantage of the advertised $1 off coupon. 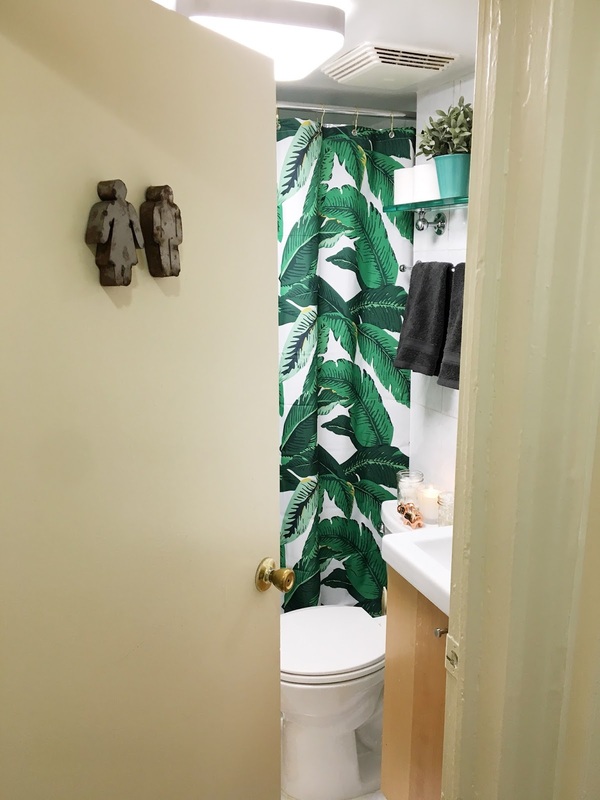 I also started my bath mat search on Amazon, naturally, but was met with a number of discouraging reviews, including talks of mold and splinters. Let us keep in mind I saved the Apartment Therapy bathroom roughly six months before I added anything to my cart, so at some point after my initial Amazon search, Target released a bamboo mat for hella cheap. Compared to the Amazon mats I found, the only negative review was that the floor gets wet. SHOCKER! It has glaringly obvious gaps between the slats. Regardless, our bathroom floor is frequently wet, even with an absorbent foam mat, so I wasn't deterred. For $11, it was at the very least worth a test. 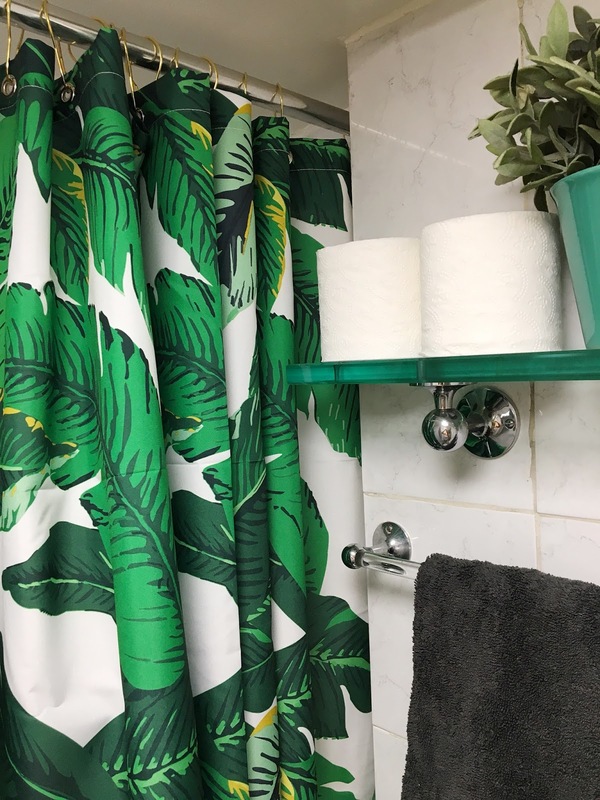 While I was happy to replace the moldy plastic shower rings that would surely cause our apartment to fail a health inspection, had I not stumbled on a set of gold shower hooks while paroozing the beautiful aisles of H&M's home section a few months ago, I most likely would have carried on, business as usual. Thank god for small favors, am I right? Lastly, I had spotted a bin of metal gender molds at the Brooklyn Flea Market this summer and my mom picked up a pair for me as a Christmas stocking stuffer when she was in town visiting. 10 minutes total installation time and we're basically living in a bargain bin, basement level spa. Love the shower curtain! And is that a little elephant on your toilet tank? Really cute! Thank you so much Brandon! And yes, that is a little elephant ring holder I got for Christmas. Holy crap you have a good eye!